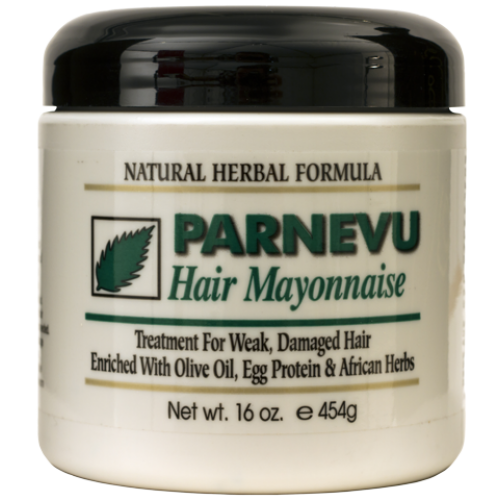 PARNEVU Hair Mayonnaise provides intense rejuvenating therapy specially formulated for weak, damaged or over processed hair. Enriched with olive oil, egg protein and herbs to promote healthy hair and scalp. It works from within the hair shaft to help strength fragile roots, mend split ends, and moisturize dry brittle hair. This conditioning formula combines rich botanicals and herbs for intense healing, olive oil moisture, and strengthening power egg protein to help bring hair fibers back into balance. The non-greasy formula leaves hair healthy and silky with added body and shine. Excellent for daily moisturizing treatment or intense healing in severely damaged or weak hair. Directions for Use: Daily Use - Rub a small amount between palms and spread evenly through hair from roots to ends. Style as usual and re-apply to weak, damaged areas as needed. Deep Conditioning Treatment - After shampooing, towel dry hair and massage a generous amount into hair, covering from roots to ends. Cover hair with a plastic cap or a hot moist towel and leave in hair for 10 minutes. Heat may be applied with a hair dryer for added penetration. Rinse hair thoroughly with warm water and style as desired. INGREDIENTS: Water, Olive Oil, Glycerin, Cetearyl alcohol, Ceteareth-20, Polyquaternium-37, Dimethicone, Laneth-15, Cetyl alcohol, PPG-5-Ceteth-20, Isostearamidopropyl laurylacetodimonium chloride, Albumen (egg protein), Cholesterol, Tocopherol acetate (vitamin E), Retinyl palmitate (vitamin A), Cholecalciferol (vitamin D3), dl-Panthenol (vitamin B5), PEG-8 dimethiconol olivate, Carrot oil, Stinging Nettle (urtica dioica), Sage (salvia officinalis), Rosemary (rosmarinus officinalis), Watercress (nasturtium officinale), Irish Moss (chondrus crispus), Coltsfoot (tussilago farfara), Burdock (arctium lappa), Elder flower (sambucus nigra), DMDM Hydantoin, BHA, BHT, Benzophenone-4, Fragrance, FD&C yellow #6 (CI15985), D&C orange #4 (CI15510).